Being a mother is a journey filled with blissful moments but also times of intense frustration. We are plugged in, overstimulated and we struggle to relax. Children absorb our stress. For us to have content children we must find a way to connect with ourselves, our children and the world around us. Mother Om provides you with the tools to manage the emotional journey of motherhood. Written by yoga teacher, mother and founder of www.yogamamata.com, Leonie will guide you along a spiritual path by opening up your conscious mind and teaching you to be present, speak your truth and live with an open heart. Mother Om shows you the benefits of yoga and mindfulness for children and includes practical advice and meditations for you and your children. If you value compassion, connection and commitment, Mother Om will motivate inspire and empower you. Mother Om won an Evergreen silver medal in the Living Now book awards in the USA under the health and wellness category. "Written from the heart, Leonie paints a vision of a better way to be in the world; a way that embraces gratitude, acceptance and peace. But best of all, Leonie understands what busy mothers need more than anything else, and that is self-compassion". 5.0 out of 5 starsAn amazing journey! Leonie is so down to earth and offers fantastic tips and guidance in being a mindful mother. Highly recommended to all mums who want to live in the present and enjoy every moment with their beautiful children. 5.0 out of 5 starsI loved this book! I loved it! I found it very thought provoking and soul stirring. 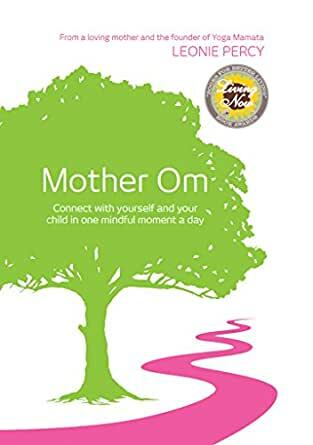 Mother Om inspires mums to use mindfulness, yoga principles and simple exercises for the mind-and-body to meaningfully connect with ourselves and our children. Leonie offers imaginative inspiration for enjoying mindful moments with your children that express your love, and provide the both of you with coping skills for life. I only wish I had read Leonie’s book earlier in my mothering journey – her kind advice, offered from one mother to another, would have breathed calm into the bumpier parts of the ride! If you would like your experience of motherhood to be one of balance, growth and calm then this book is for you. This book is a great introduction to yoga and how you can use it to reduce stress in your life. Being a Mother can be quite stressful at times but this book shares some very useful tips that show you how it is possible to enjoy your life as a mother. Thank you Leonie for introducing me to yoga, something that I had dismissed in the past as too "slow" for me, I now realise it is exactly what I need. I am off to find a yoga class to join. I would highly recommend this book yo any mother who feels stressed and overwhelmed at times. I'm not a mother but I am a coach and a yogi so I'm sure this book will greatly serve anyone who reads. The world is ready for someone like Leonie who integrates mindfulness and motherhood. 5.0 out of 5 starsVery interesting! This is just an amazing read! I always loved yoga, however never thought of yoga for kids. Thanks for planting this thought, my baby is only 3 months old but I will definitely try to practice it with him. Loved it! 5.0 out of 5 starsInspiring! A must read for all parents. Mother Om is only parenting book I’ve ever read that truly inspired me to be a better mother. Not only does it inspire you to be present in your child’s life but it gives practical tips on how to achieve this goal. I am a calmer, more content parent and have now found both myself and my family benefiting from the yoga techniques explained in this book. To any parent wanting an introduction to yoga, or simply wanting to achieve their goal to be a more mindful parent, I cannot recommend this book enough. 5.0 out of 5 starsA beautiful book for mums to reconnect, feel happy and enjoy motherhood. Loved this book! I've been using Leonie's tips every day to slow down and create mindful moments for me and my family. This is a great book to keep handy - there's always a quick tip to use for whatever is happening, whether it's feeling stressed, tired or just a little disconnected. This goes well beyond yoga and meditation - it's full of beautiful inspiration for every mum to feel happy and centered.